As the spring semester ends and elected officials approach critical votes, students across the country are rising up to take back public education. E-mail questions, tips or proposals to studentmovement@thenation.com. For earlier dispatches, check out posts from January 18, February 1, February 15, March 1, March 15, April 2, April 15, April 26 and May 10. On Monday, May 20, the Chicago Students Organizing to Save Our Schools organized a citywide boycott so that students could join a three-day march in protest of school closures. More than two hundred students participated from high schools across the city. In the morning, students met at Williams Elementary, which the school system ordered to be put on lockdown. From there, we marched three miles downtown, where 26 activists were occupying City Hall in an act of civil disobedience. The action ended with a large rally at Daley Plaza, with speakers ranging from teachers union president Karen Lewis to third grader Asean Johnson. 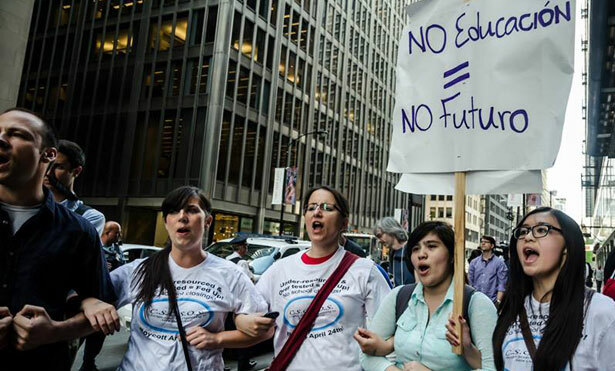 On May 22, as activists occupied the central lobby, Chicago’s unelected board of education voted to close 50 schools. Students and allies are overwhelmingly upset—but the fight for these schools is not over. I was one of the 2,000 Philadelphia students who walked out of school on Friday, May 17, to assert a student voice in the face of school closings and disinvestment. By Saturday, I was in Chicago joining the struggle against school closings there. Chicago’s closings, like Philadelphia’s, are primarily in black and Latino neighborhoods. After marching through the north, west and south sides of the city, I spoke alongside students from Chicago at Daley Plaza. Next, we marched and held hands around City Hall—where teachers and community members were arrested for sitting in. Students from Philly, Boston, Baltimore and Detroit came to support Chicago’s fight. As students, we will continue fighting in every city until we have the schools we deserve. On May 4, the Los Angeles Police Department deployed 79 officers in riot gear to shut down a peaceful graduation celebration attended primarily by black and Latino students at the University of Southern California. Nine student leaders were arrested, six spent the night in police custody and others were herded off the block and physically assaulted. Charges against arrested students are still pending and await court proceedings on May 30. This incident, along with a string of similar happenings, sparked what has become known as the #USChangeMovement. On May 6, more than 200 students, faculty and local residents sat-in at Tommy Trojan to protest and exchange stories of discrimination and racial profiling at USC and in the greater Los Angeles area. On May 7, more than 1,000 people attended an on-campus discussion with students, the LAPD, the USC Department of Public Safety, the HR Commission and USC senior administration members to seek answers and draft joint solutions. USC students are propelling citywide movement to end racial profiling, excessive force and selective law enforcement—all while embracing peace, intellect and understanding. In October 2012, Crenshaw High School received notice from LA superintendent John Deasy that the school would undergo a “transformation” starting this summer. Under the transformation, more than half of Crenshaw’s teachers—many of whom are older, black or active in the union—have been rejected from returning. The conversion of Crenshaw into three magnets means students have to reapply—likely pushing many out. This move comes at a time when Crenshaw has been showing improvements through its innovative Extended Learning Cultural Model, which prioritizes culturally relevant education and project-based learning. Connecting Crenshaw with recent upheaval at other black and Latino high schools in South LA, the Crenshaw community has been organizing against the transformation. As part of the Coalition for Educational Justice, Taking Action and the school’s Sierra Club, we’ve given presentations and developed a survey to ask our fellow students about their experiences at the school. The data from the 500 students we’ve collected will be presented at a forum on May 28 for students to voice their opinions about school transformations all over South LA. On April 29, dozens of Gay-Straight Alliance club activists joined together in Sacramento for Queer Youth Advocacy Day to rally for middle schools and high schools where all students can succeed. We spoke to legislators about the School Success and Opportunity Act (AB 1266), which makes sure California schools know that transgender students have the full right to participate in all school programs. Students shared their experiences of how not being included with students of the gender they identify with can have disastrous consequences such as forcing them to drop out of school. Others talked about school districts that do allow them to participate fully, like LA Unified, which shows that implementation of this bill is possible and positive experiences can come from it. The bill has now passed through the assembly and is headed for the senate, where we will continue to advocate to keep all students in school. When students in California have problems like not getting to class on time, fighting or breaking school rules, schools handle these situations with suspensions, expulsions, and school police tickets that hit youth of color hardest. For the past five years in LA, the Community Rights Campaign has built a student movement that organizes on buses, in our neighborhoods and at city hall and the school district board. We led a fight against the top school police citation—$250 truancy and tardy tickets—and won big changes to that policy last year. We have now joined with other youth and community groups, allies and advocates across the state around a new legislative agenda. Last year we passed five bills to reform zero tolerance policies. This year, in response to the post-Newtown push for more police in schools, we are trying to pass AB 549, a bill that would help limit the role of police in school districts and prioritize funding for counselors, intervention workers and other mental health services. The bill will be headed for a full assembly floor vote if it clears its final committee hearing this week. On Nakba Day, in solidarity with global demonstrations for Palestinian rights, a coalition including Palestinian, Israeli, and American Jewish students staged a checkpoint at Middlebury to call on the college to divest from companies doing business with Israel. At Middlebury, Justice for Palestine has united with an array of campus groups, including environmentalists calling for the college to divest from fossil-fuel companies, to make the call. Politicized by the trustees’ failure to honor their initial commitment to vote on divestment in May, students are refusing to budge from an intersectional analysis of oppression in divestment organizing—for which four students were arrested in March and five were nearly expelled in the fall—and are gearing up for escalation. On March 28, after a year of planning and relationship building, subcontracted dining hall workers at the University of Pennsylvania went public with the Justice on the Menu campaign, demanding higher wages and more paid sick days. Alongside student allies in the Penn Student Labor Action Project, workers held a large rally in March, launched a website and video and were featured almost weekly in the campus newspaper this spring. Students also collected over 1,100 signatures in a petition delivered to University President Amy Gutmann. The semester ended with a successful unionization process with Teamsters Local 929 for workers at Falk Dining Commons. As contract negotiations take place in the coming months, students and workers will continue pushing for improved job standards and working conditions on campus. 9. How Long Will Sallie Mae Profit Off Student Debt? On May 9, twenty students from the United States Student Association, the Student Labor Action Project and allied organizations met with US Secretary of Education Arne Duncan to discuss the DOE’s relationship with Sallie Mae, the largest private owner of student debt in the country. Sallie Mae made $84 million in profit on federal loan servicing contracts last year alone. The students came to the table to pressure Secretary Duncan to break Sallie Mae’s contract or incentivize the companies processing federal loans to enroll debtors in programs like Income Based Repayment that prioritize helping people with student debt get back on their feet. On May 30, students from across the country are going to Sallie Mae’s shareholder meeting in Newark, Delaware. 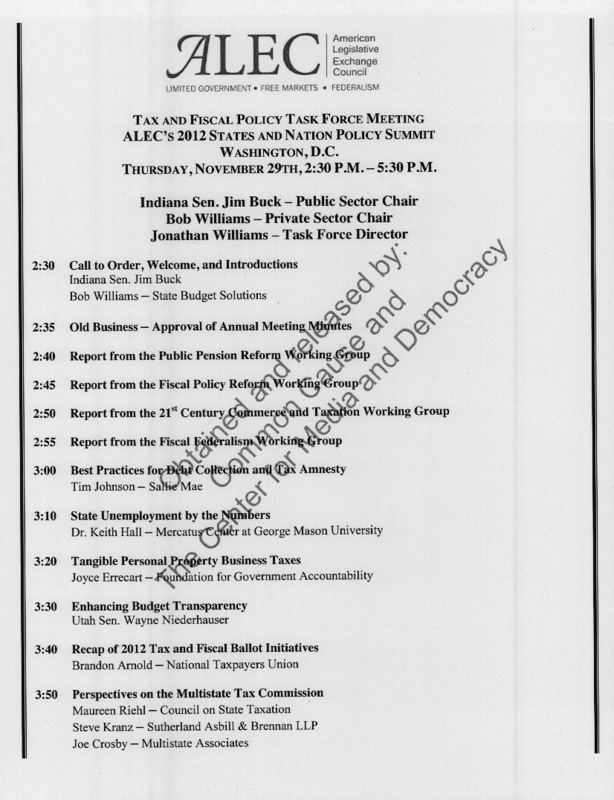 We plan to pressure Sallie Mae to open up about their relationship with ALEC and their process for paying their top executives. 10. How Long Will Students Wait for Arne Duncan? On June 1 and 2, student debt advocates from across the Midwest are coming together in Chicago to discuss a national student debt campaign, the first of a series of regional meetings to tackle educational debt. The campaign’s focus and strategy will be hammered out this summer with participating organizations. Based on existing conversations, the initial goals and strategies revolve around a commitment to quality higher education as a public good that should be affordable and accessible to all. Three areas to advance this long-term goal include: providing support to borrowers currently paying off the existing $1 trillion in debt; addressing causes of declining affordability and quality, including changes to state funding and financial aid policies; and addressing the role of Wall Street and the growing financialization and privatization of higher education without the burden of financial hardship.